Fingerprint scanners in smartphones are starting to gain traction with Apple, Huawei, HTC and Samsung just a few of the big names implementing the technology in their handsets. But not Motorola. 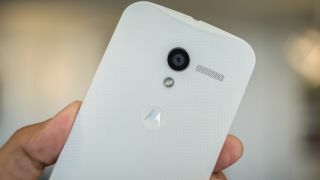 TechRadar sat down with Motorola's President Rick Osterloh at MWC 2015, where he explained the reasons why his company's devices are currently void of the digit reading tech. "Fingerprint scanners are not ready for prime time," Osterloh said in response to a question about the technology for smartphones. His reasoning is two fold, firstly Osterloh claims that most of the time you can enter a pin at almost the same speed as having your finger scanned. Secondly, he highlights the high error rate of some scanners, forcing people to have more than one attempt and wasting more time trying to unlock their phone. He concluded that the process isn't at a point where it provides a genuine advantage for users, although many will argue the opposite. Osterloh also fired shots at rival smartphone manufacturers, stating "people increase prices for things which are pretty incremental, and I think that's wrong." No names were mentioned, but it's clear the statement was directed at some of the biggest brands in the mobile market. For now then we're unlikely to see biometrics in Motorola handsets this year, and the likelihood is the firm will continue to drive its value propositions in its E, G and X ranges.